A decommissioned cast iron pipe (refer to Fact Sheet No.5, May 2013) in Strathfield, Sydney was instrumented as part of the approach in Activity 1 to answer the question how, where and when pipes fail in a network. 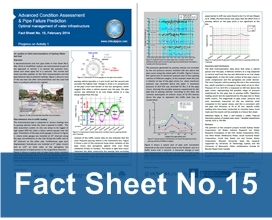 The current fact sheet provides updates on the field measurements and the pipe behavior due to external loadings. Figure 1 shows a view of the test bed site after instrumentation and the road had been re-surfaced with hot mix asphalt.